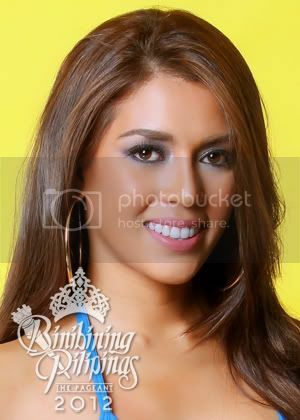 Notes: Mary Jean Lastimosa was the 2nd run-up in Bb. Pilipinas 2011 beauty pageant. Mary Jean Lastimosa or "MJ" as she was popularly called stands 5’ 5 1/2″ tall. She is already a veteran in joining pageants. She is the former Mutya ng Dabao. She won different local pageants, and represent Davao City in Japan before and she made her way to Binibining Pilipinas 2011 where in she finished as the 2nd runner-up. MJ has a good mixture of Filipino and Middle Eastern lineage for being a half Arabian. Both this races flowing in her veins gave her the materials for being one of the strong contenders in this year’s as well as last year's pageant. She graduated her Bachelors degree in Computer Engineering in the University of Mindanao. Some of her achievements in local beauty pageants are Mutya ng Tulunan 2003, Lakambini ng University of Mindanao 2004, Mutya ng North Cotabato 2004, 1st run-up, Davao’s Loveliest 2005, 1st run-up, Mutya ng University of Mindanao 2006, Miss Regional PRISAA 2007, Miss National PRISAA 2007, 2nd runner up, Mutya ng Davao 2008 and Reyna ng Aliwan 2008.